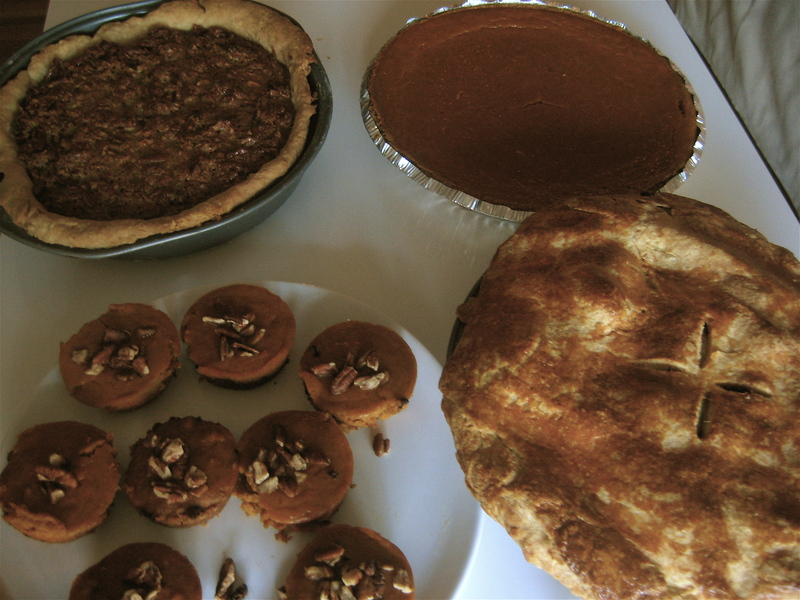 Happy Thanksgiving: Desserts! – Voila! Last weekend our plans for Thanksgiving got turned inside out and upside down. We were going to go back to North Carolina. Then maybe California. Then definitely Ohio. Then none of the above. Then we decided to stay put, avoid ridiculously expensive airline tickets and long drives. We discovered that several of our friends were in town too, so that’s where we’re headed today! Although we both miss being with our families, we are loving just being home. This is the first time in six weeks at least that we’ve both been home and just able to relax. I can’t remember that last time we woke up slowly, deciding whether or not to get out from underneath our big comforter or run to the couch in a robe and have a leisurely breakfast. So after watching most of the Thanksgiving Day parade. I started making the first of three pies.On the menu I planned to make: a traditional pumpkin pie, apple pie and german chocolate pecan pie. The plan was to create these three desserts. But when I had about 2 cups lefts of pumpkin pie filling, I went all out and tried something new, like mini pumpkin pies with mini chocolate chips. Then when I ran out of the filling, I just added pecans instead of the filling. All these recipes plus the bourbon sweet potatoes are below! You’re Thanksgiving desserts look delicious. I especially like that apple pie crust! Nicely done.